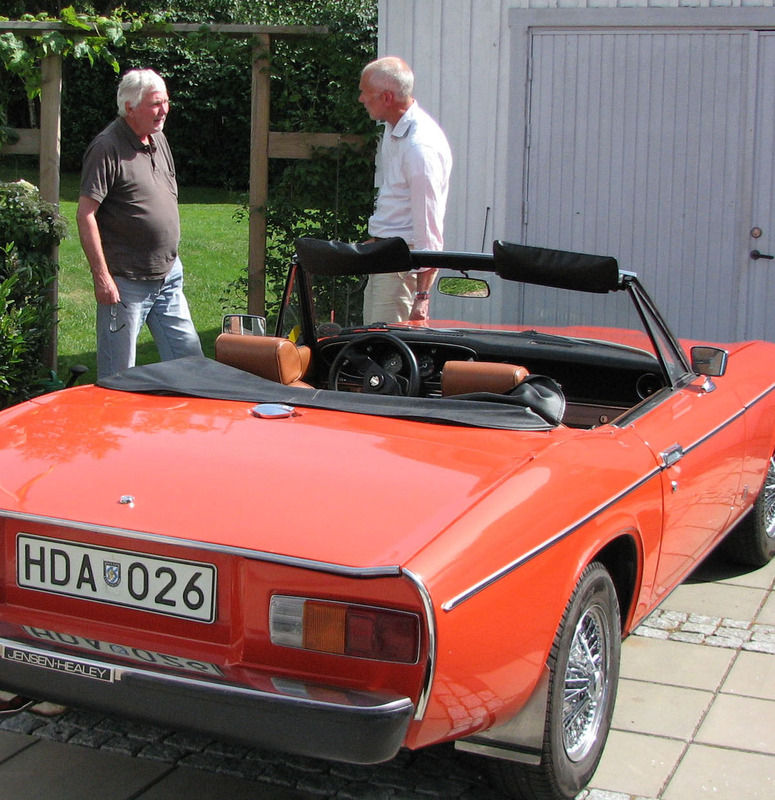 Niels-Erik Manniche has been the chairman of the Danish Jensen Owners’ Club since 2015, and owns both a Jensen-Healey, and a Jensen GT. The Jensen-Healey, chassis number 15 036, was one of the few cars sold through the Swedish distributor, AB Wendels, from Malmo. 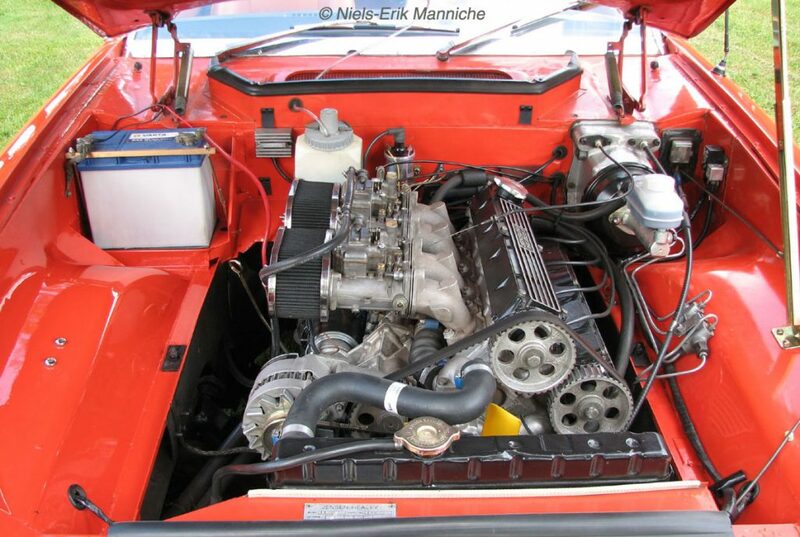 Manniche tells us the story of his Jensen-Healey. 1120 /15036 was completed in December 1973, and inspected by Jensen Motors Inspector, Colin Woolman on Christmas Eve. Woolman notes this LHD car was painted in Tangerine and destined for AB Wendels in Sweden. 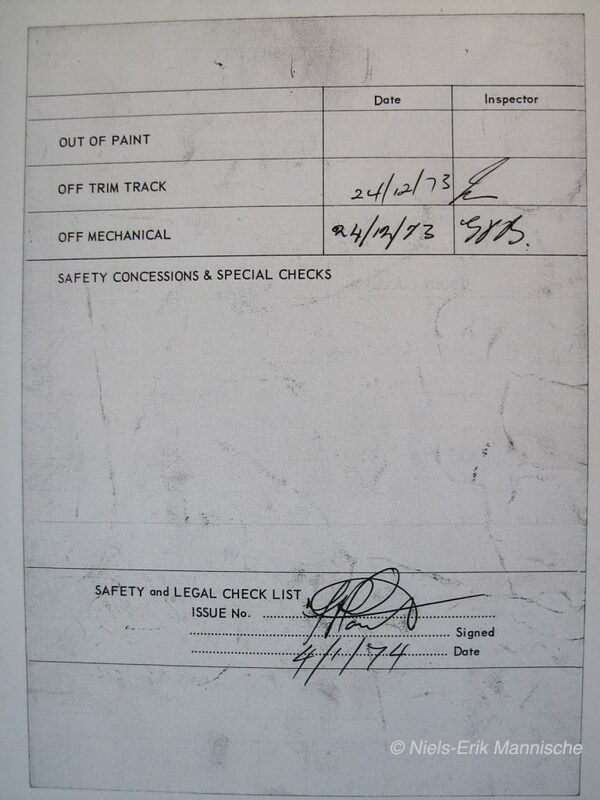 The car was signed off for trim and mechanical on the 24th December, and on the 4th January 1974, was signed off for the car’s Safety & Legal checks. 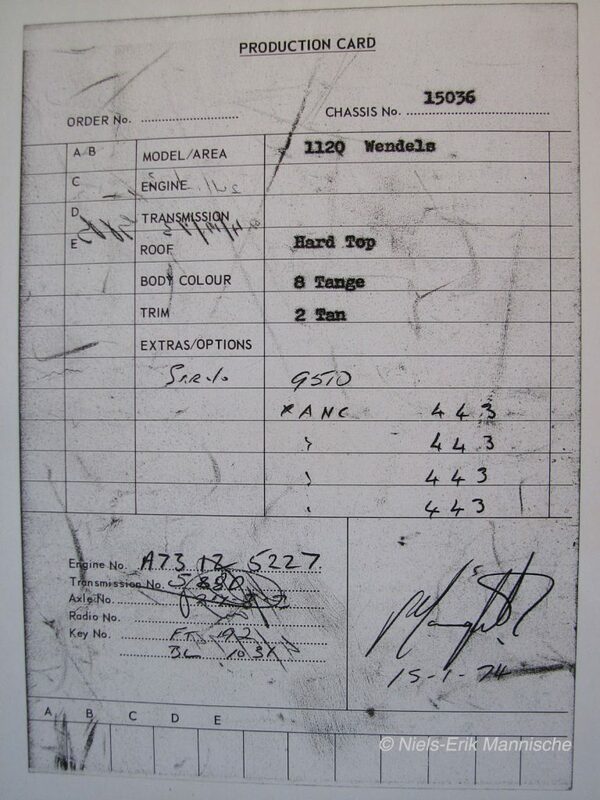 The Jensen factory production card. With the car signed off, it was road tested, and made ready for export to AB Wendels. On the 23rd January 1974, AB Wendels took delivery of their first Jensen, since being appointed as Jensen distributors for Sweden. Undoubtedly due to the Swedish winter, Jensen-Healey 15 036 spent the rest of the winter on display in AB Wendels warm Malmo showroom. As winter passed into spring, it was time to have 15 036 registered for the road, and the first MOT took place on 22nd April 1974. AB Wendels had been contacted by the Swedish magazine, Teknikens Värld. They asked if they could have loan of the Jensen-Healey for a magazine article. The loan took place after registration and MOT of the car, and the completed article appeared in their June 1974 edition. “A pleasure when the sun is shining. A clear morning. The road is open. Helmet, gloves, a windproof jacket. Full tank, a long trip to do. The ideal conditions for the Jensen-Healey – one of the last real British sports cars. 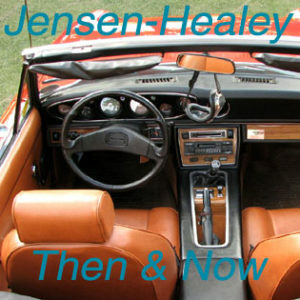 Jensen-Healey is such a car which makes the enthusiast a little warm hearted at the first glance of the car. Open, low, quickfill cap, and other features which belong to the classical British sports car. But, all that have owned such a car understands their charm is certainly two-edged. Body rattling, and markedly hard damping are usually the standard equipment for the British sports car. Often the engine and road-holding doesn’t live up to the car’s sporty appearance. The Jensen-Healey deviates from this template. Not only is it an open two-seater sports car, but it is comfortable, quick, and smooth to drive. 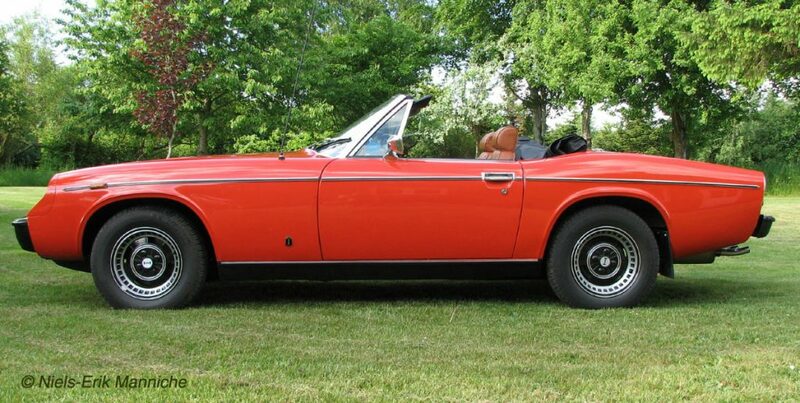 The price for this car is 37,000 SEK, or 38,500 with removable hard-top (which by the way has a heated rear window). Expensive ? Yes, but an Alfa Romeo 2000 Spider will cost you 39,500 SEK, and a Porsche 911 Targa about 60,000 SEK. 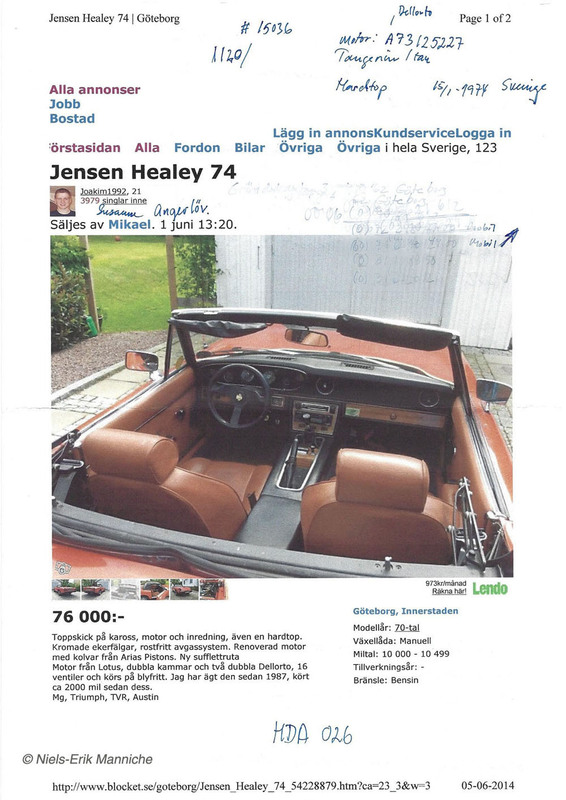 In Sweden, the Jensen-Healey is marketed by Wendels in Malmo, a company having specialised in high class sports cars. The set up of the Jensen-Healey is simple: engine to the front, rear-wheel-drive, spiral suspension, rigid rear axle. The best part of the car is the engine. Quite, flexible, and so strong that you almost wonder if the cylinder volume is in fact just two litres. The best torque (in practise the ability to pull) is even up to 5000 rpm, but this does not prevent the engine to pull off clean from mush lower rpms. When you let the speed drop to 25mph in forth, and then put the pedal to metal, the car pulls away as if it has a three litre 6 cylinder engine, instead of the two litre 4. With 15 036 back from loan, the Jensen-Healey was placed in AB Wendel’s showroom for sale. A buyer came forward quickly. Anders Bergman from Stockholm, purchased the car, and owned it between 4th June 1974, and 5th May 1978. 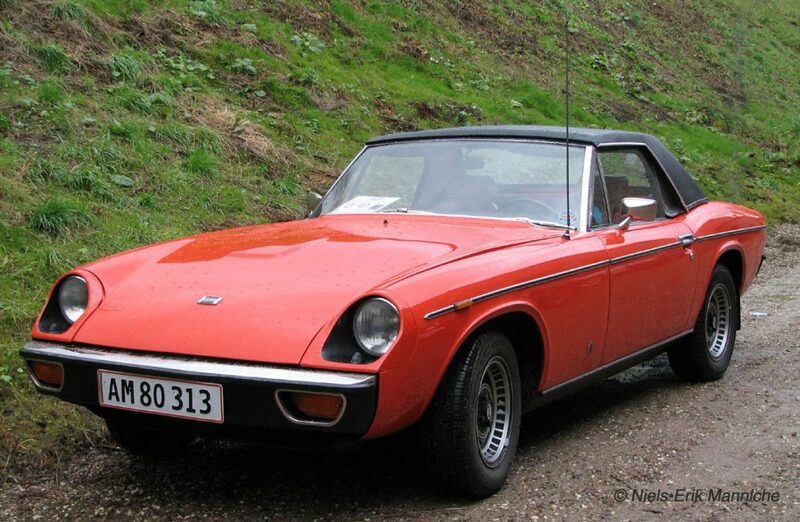 The car then had two further owners, before being sold or part-exchanged back to AB Wendels in August 1980. By December 19890, AB Wendels had managed to sell the car for a second time. The new owner, Hans Arklöf, lived up at Storuman, a good 15 hour journey from Malmo. He owned the car from 1980, through to may 1982. Another owner, and a wait in another garage for a buyer, took the car up to 1987. 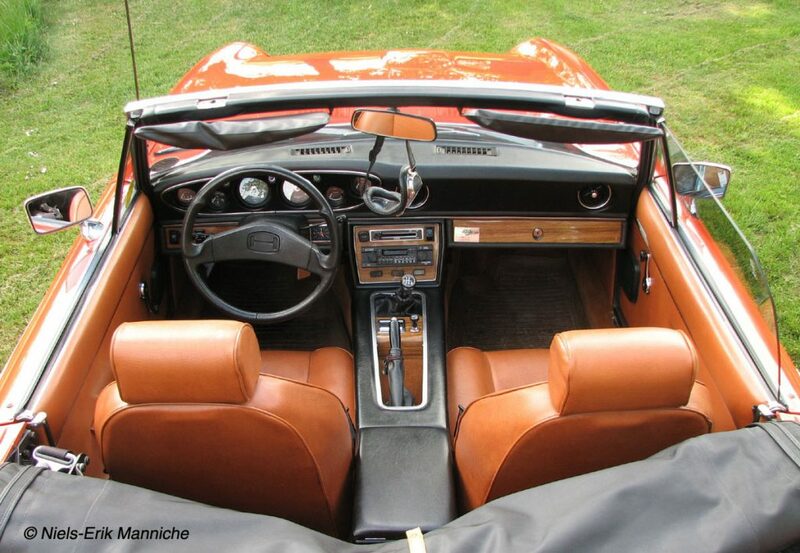 In July 1987, the Jensen-Healey had been purchased by Lars Angerlöv from Göteborg. 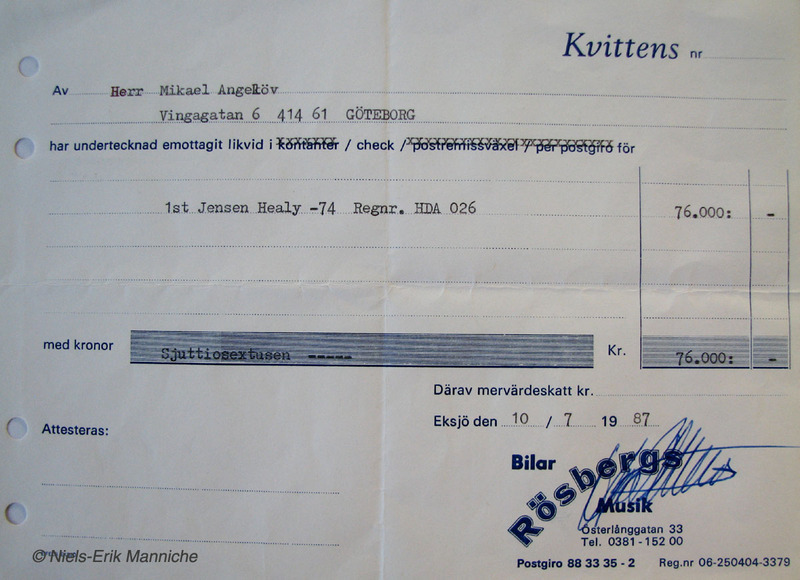 Invoice for the purchase of the Jensen-Healey by Angelöv. “Mikael Angerlöv has owned his Jensen-Healey for almost a quarter of a century. The condition of his car is nice, with patina from 1974. The body has not been re-sprayed, the marks from the hard-top – the black roof which Mikael of course has kept – are still there but the aluminium wheels have been replaced with wire wheels. With a nagging wish for a more up-to-date sports car, it was inevitably only a matter of time before Angerlöv parted with the Jensen-Healey. Enter Niels-Erik Manniche into the story of 15 036. “After having communicated with the seller about the technical condition and the cars history, we agreed on a date to meet. The seller had required that payment should be done in cash in Swedish 500-kronor notes. So I took two friends with me, so they could help me assess the car and act as personal security. We left Denmark early in the morning in a rented light auto-transporter. It was a beautiful summers day and after about three hours cheerful driving we reached Gothenburg. Here we were picked up by the seller driving the Jensen-Healey, and he led us trough the town to his home address. We inspected the car (which had covered just under 104,000 verified kms) and it was time for a test drive – the seller in the passenger seat acting as co-driver. I must say that it was far from a positive experience. Already in the first roundabout the car would not take the gas and it ended almost in a stand still. It was more or less either idle gas or full gas. I managed to nurse the car back to the seller’s house – heavily sweating after the stress of driving a car in this state, in a foreign city centre. I should probably have said goodbye at this point, but I was confident that I could easily sort this out, and the car looked very original, well kept and nice. Jensen-Healey 15 036 photographed in Denmark during 2018. The car’s engine-bay. 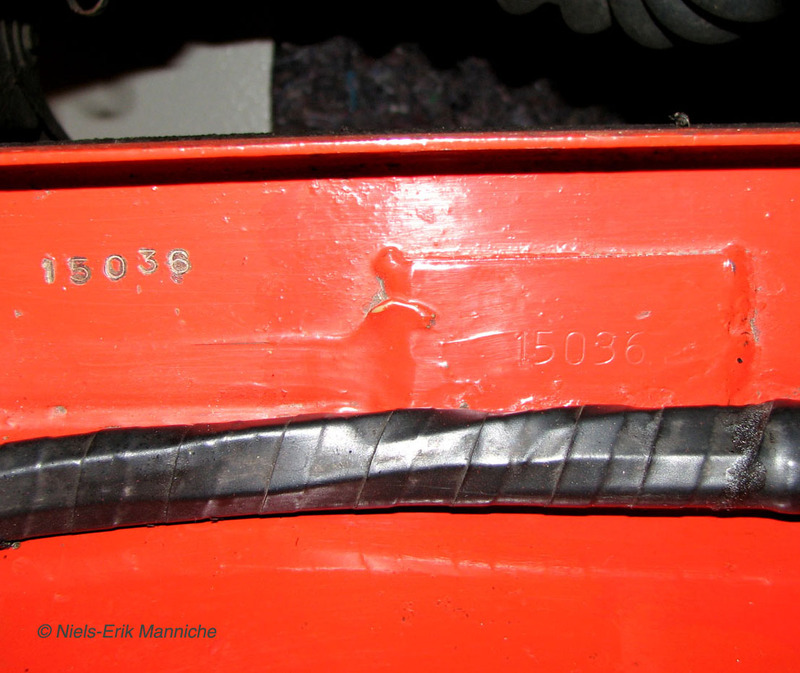 During the car’s life, it has lost the original air filter can, and also the cam-belt cover. Chassis numbers stamped direct to the chassis. In the case of 15 036, this was done twice. 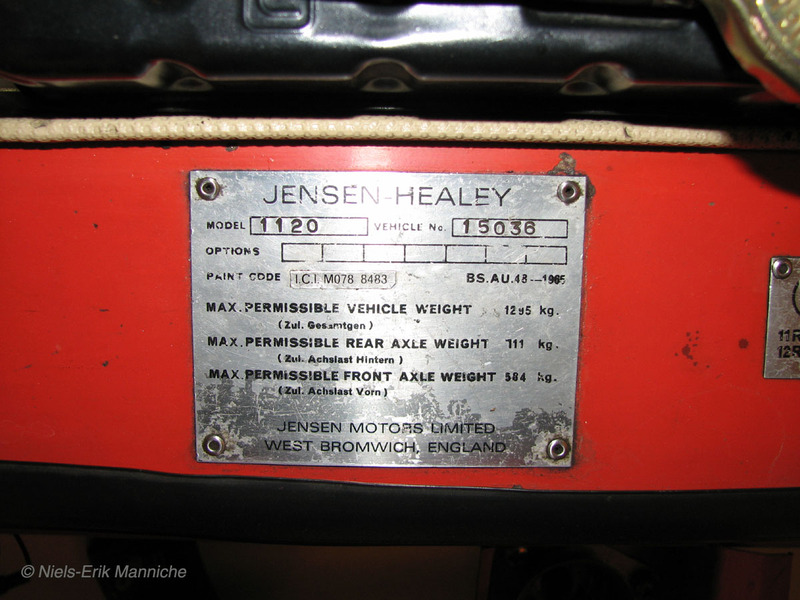 As of 2019, Manniche remains the proud owner of a particularly original Jensen-Healey, and one of the few cars ever supplied by Jensen’s Swedish distributor.